The CUTRIC project involves on-route, high-powered charging stations integrating with local utility systems. New Flyer Industries Canada ULC congratulated the Canadian Urban Transit Research and Innovation Consortium (CUTRIC) on the successful launch of its multi-manufacturer interoperability demonstration hosted in Vancouver, as part of its Pan-Canadian Electric Bus Demonstration and Integration Trial. The project involves on-route, high-powered charging stations integrating with local utility systems. This makes Canada the world’s first country to demonstrate an interoperable electric bus trial, involving multiple buses and charging station manufacturers. 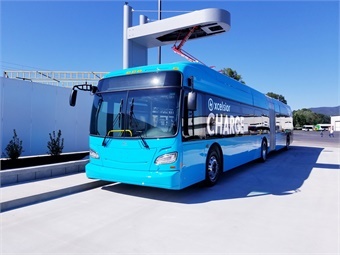 The project spans three communities across Canada (Vancouver, Brampton, and York Region) and will test interoperability of electric transit vehicles using a new standardized high-powered overhead charging system. Vancouver is the first to launch, with CUTRIC’s next events occurring simultaneously in Brampton and York Regions April 16. The project is expected to reduce direct CO2 emissions by up to 101,867 tonnes over the lifecycle of the vehicles deployed across the country. In Vancouver, TransLink will own and operate its own charging systems, while sharing data with BC Hydro. With a vision to make Canada a global leader in zero- and low-emissions transportation technologies, including advanced and integrated mobility technologies, CUTRIC works to support research and development through industry-academic collaborations that bring innovation, design, and manufacturing to Canada’s transportation supply chain. Through this work, CUTRIC will help decrease fuel consumption, avoid wasted infrastructure assets, and reduce redundancies in operations. New Flyer has been a member of CUTRIC since inception.